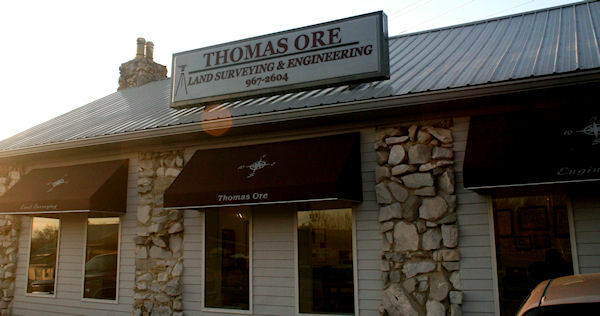 Thomas Ore Land Surveying & Engineering in Winchester, Tennessee is a family owned and operated design firm providing support in the Middle Tennessee region for all kinds of projects, be it residential, commercial, industrial, and even government. Our service area includes but is not limited to Marion, Grundy, Coffee, Franklin, Lincoln, Moore, Warren, and Bedford counties. We're ready to assist you with all your land related needs; we are a full service company! This means NO job is too small OR too large. From small lot surveys to large boundary surveys, from commercial site plans to a master planned subdivision, we are always eager to help people get through the often unfamiliar process of dealing with property related issues. We provide free estimates, and would appreciate the opportunity to work with you. Follow the links above for samples of our surveying work, some about our company and staff history, and a list of other helpful sites. If you want to get in touch with us, click on the contact link above. Call or write us for any Land Surveying or Civil Engineering need!